Volkswagen has revealed its new e-Golf at the Los Angeles Auto Show, which offers around a 50% longer driving rage plus a boost in power and extra technology including gesture control. Following last week’s reveal of the 2017 Golf, the new e-Golf also introduces a sharpened design for the front and rear including new full-LED headlights and full-LED tail lights. It also gains increased range. Driving range under the NEDC cycle increases around 50% to 187 miles while USA tests on the ‘estimated real-world driving range’ measures it as 125 miles (EPA). 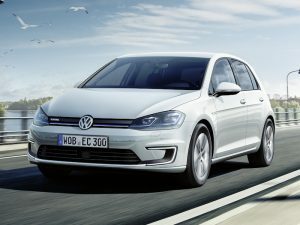 Power has also been increased and the electric motor now develops 100kW, up 15kW from the original version of the e-Golf. At the same time, the maximum torque of the electric motor has been boosted from 199b.ft to 214b.ft, giving it a 0-62mph time of 9.6 seconds (previously: 10.4 seconds) and a top speed up to 93mph from 87mph. The e-Golf also features a new lithium-ion battery with energy capacity increased from 24.2 kWh to 35.8 kWh. The battery can be charged to 80% capacity within an hour at a CCS charging station (DC, 40 kW). A full charge from a wallbox (AC,7.2 kW) takes less than six hours. Technology updates see the e-Golf become the world’s first battery-electric car with an infotainment system that offers gesture control as standard, according to VW, and comes with a 9.2-inch system. The e-Golf also features the Active Info Display as standard, replacing the previous analogue instruments. There’s also an e-Remote that enables drivers to start/stop battery charging and air conditioning remotely. Sales are expected to start in early 2017.